The variety of music on display at Ilosaarirock never seizes to amaze me. OJJ’s performance on the Rekka Stage added eclectic chiptune to Sunday’s motley medley of styles ranging from Ellie Goulding’s pop to Opeth’s metal to Death Hawks’ shamanistic stoner groove. 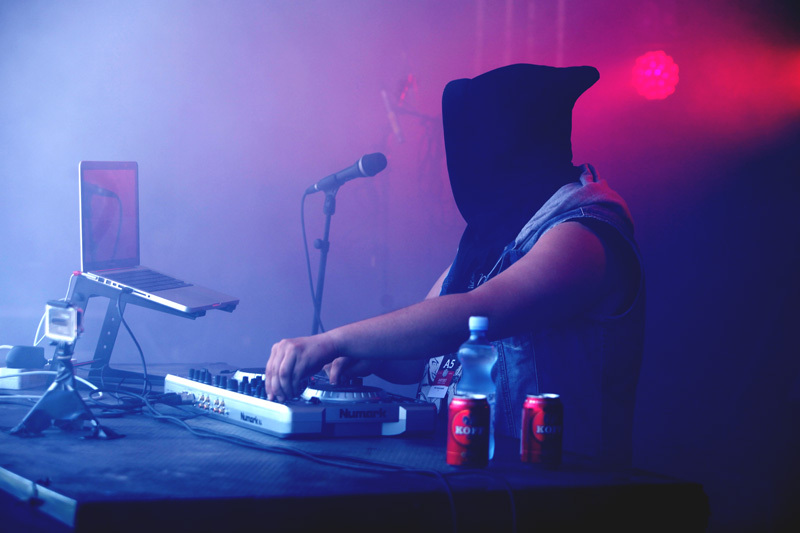 OJJ, an enigma local to Joensuu, took the stage in a sleeveless denim vest and a black hood that hid is face from view. From behind his battle station at the center of the stage, this modern-day executioner conjured up a sound so massive it shook the ground and got into the very bones of the onlookers, forcing the more receptive ones to bounce like possessed puppets. Now, I don’t know the first thing about chiptune music. I can’t even grasp how it’s made. It has something to do with Gameboys, computers and magic, right? Still, I do appreciate big beats, I cannot lie. And nobody can deny that the sound created by OJJ almost made Rekka Stage feel too small. This dude needs a bigger stage with even bigger speakers and even more smoke blowing out of them damn smoke machines. The aggressive turns a beat would take, the 80s nostalgia soundscape, the maestro sipping his beer to quench his other-worldly thirst… More people need to hear and witness this act. Maybe at Sue Stage next summer, hmm?